There are many myths about low carb diets. Perhaps the most common myth is one perpetuated by people in the medical profession who don’t understand nutritional ketosis, confusing it with ketoacidosis. When low carbohydrate, high fat diets induce the body to shift to ketones in place of glucose for normal metabolism, ketones become significantly elevated in the transition period, then stay slightly elevated thereafter. Ketoacidosis is an extreme pathological complication of diabetes in which ketones become very elevated, with serious potential health consequences. 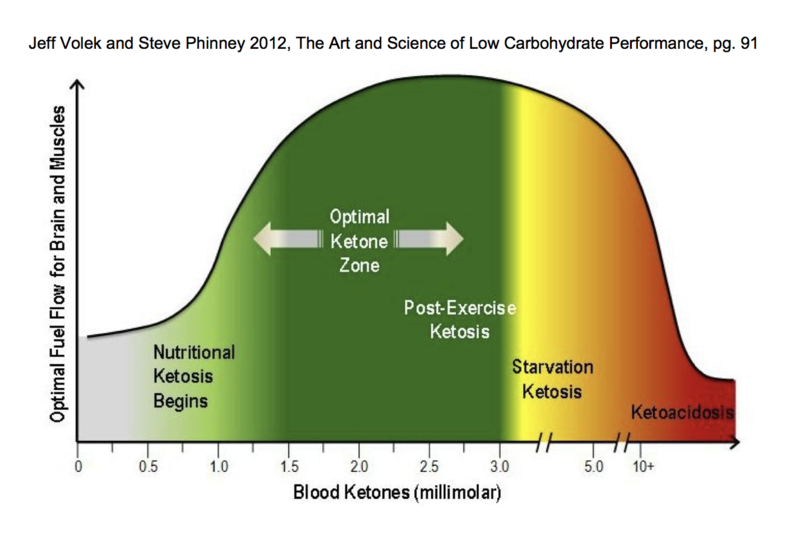 Here’s a chart from Jeff Volek and Steve Phinney’s Art and Science of Low Carbohydrate Performance showing typical levels in the various possible states. Here’s a 39 minute interview with Dr. Eric Westman, Director of the Lifestyle Medicine Clinic. Westman has taken the work of Dr. Robert Atkins and tested the results clinically. This answers some of the questions I’m asked when I talk about our history as low carb predators. This is a pretty casual and personal conversation between Dr. Westman and Sam of Smash the Fat. Nothing is copyrighted here. The information presented is a collection of ideas and opinions. Think and make your own decisions.